Grandes lignes: Verses from Matthew 24 plus Romans 5:8,9 on the happenings at the end of the world. Background knowledge needed. And as Jesus sat upon the Mount of Olives, the disciples came unto him privately, saying "Tell us, when shall these things be? And what shall be the sign of Your coming, and of the end of the age? And Jesus answered and said unto them, "Take heed that no man deceive you. For many shall come in my name, saying, I am Christ; and shall deceive many, and you shall hear of wars and rumors of wars. See that you be not troubled, for all these things must come to pass, but the end is not yet. For nation shall rise against nation, and kingdom against kingdom, and there shall be famines, and pestilences, and earthquakes in divers places. (vs. l0-14) And then shall many be offended, and shall betray one another, and shall hate one another, and many false prophets shall rise, and shall deceive many, and because iniquity shall abound, the love of many shall wax cold. But he that shall endure unto the end, the same shall be saved. And this Gospel of the Kingdom shall be preached in all the world for a witness unto all nations, and then shall the end come. (vs. 2l) For then shall be great tribulation, such as was not since the beginning of the world to this time, no, nor ever shall be. (vs.. 29) Immediately after the tribulation of those days shall the sun be darkened, and the moon shall not give her light, and the stars shall fall from heaven, and the powers of the heavens shall be shaken. (vs. 30) And then shall appear the sign of the Son of Man in heaven, and then shall all the tribes of the earth mourn, and they shall see the Son of Man coming in the clouds of heaven with power and great glory. (Matt. 24:27) For as the lightning comes out of the east, and shines even unto the west; so shall also the coming of the Son of Man be. (vs. 31) And He shall send His angels with a great sound of a trumpet, and they shall gather together His elect from the four winds, from one end of heaven to the other. (vs. 40-42) Then shall two be in the field; the one shall be taken, and the other left. Two women shall be grinding at the mill; the one shall be taken and the other left. Watch therefore, for ye know not what hour your Lord does come. (vs. 46) Blessed is that servant, whom his Lord when He comes shall find so doing. 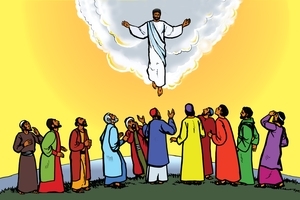 (Vs. 44) Therefore be ye also ready, for in such an hour as ye think not the Son of Man comes. (vs. 35) Heaven and earth shall pass away, but my words shall not pass away. (Rom. 5:8,9) But God commends His love toward us, in that, while we were yet sinners, Christ died for us. Much more then, being now justified by His blood, we shall be saved from death through Him. GRN has recorded a version of this script in 10 languages and dialects. See full list.